But when we talk about calculus in the dental clinic we are talking about a hardened layer of dental plaque. "Petrified plaque"
While you can remove plaque from your teeth with a tooth brush, calculus needs to be removed by the dental team with specialised instruments. Calculus is unhealthy to leave on your teeth - although most people are fairly unaware of its presence at all! Calculus traps bacteria and is a roughened surface on the tooth making it hard for you to remove plaque. The bacteria and roughness causes inflammation of the gums and bone loss. 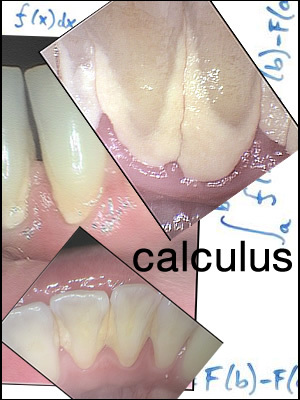 The most common place to see calculus in the mouth is behind the lower anterior teeth. All these photos are of lower front teeth. This is because this area gets a 'flood' of saliva from the duct which is under the tongue. Saliva can be rich in minerals which help protect your teeth from the acids of our diets, but it also helps build up calculus if any plaque is present on the teeth. Getting your teeth cleaned regularly helps keep this 'calculus' under control and protects your gums and bone from damage.